“Ghosts and Anchors: Translingualism in Contemporary US Poetry.” Forms of Migration: An International Conference on Transnationalism and Aesthetics, University of Graz, Austria, 2 May 2019, 2 p.m.
“Ghosts and Anchors: Translingualism in Contemporary US Poetry.” American Studies Center, University of Warsaw, Poland, 25 April 2019, 4 p.m.
“Ghosts and Anchors: Translingualism in Contemporary US Poetry.” b2@PITT Boundary 2’s Spring 2019 Conference, Pittsburgh, 6 April 2019, 10:00 a.m.
“Exophonic Writing in America.” AWP Conference and Bookfair. With Piotr Florczyk, Monica de la Torre, Gazmend Kapllani, and Wang Ping. Oregon, Portland. 30 March, 2019, 9 a.m.
“Writing War/Writing Peace: The Lice Fifty Years Later.” Third International Conference on English Language, Literature, Teaching, and Translation Studies. University of Sarajevo, Bosnia and Herzegovina, 28 September 2018, 4 p.m.
“Self-Translation as a Compositional Method.” NeMLA Annual Convention. Omni William Penn, Pittsburgh. 13 April, 2018, 11:45 a.m.
“Dear Beloved Humans: Listening to Grzegorz Wróblewski.” Poetry in Expanded Translation Conference. Bangor University, Wales. 6 April, 2018, 9:00 a.m.
“Material Transparency: On Rodrigo Toscano’s Explosion Rocks Springfield.” ALSCW Annual Conference, University of Dallas. 27 October 2017, 4 p.m.
“Translating Grzegorz Wróblewski.” NeMLA Annual Convention, Baltimore Marriott Waterfront, Baltimore. 26 April, 2017, 8:30 a.m.
From the Fishouse: A Bilingual Reading of Poets from Around the World. AWP Conference and Bookfair, Washington Convention Center, Level Two, Room 204C, Washington, DC, 9 February, 2017, 3:oo p.m.
Poetry Reading with Walter Cybulski and Caitlin Reid. The Writer’s Center, 4508 Walsh Street, Bethesda, MD, 11 December 2016, 2 p.m.
“‘Enhanced Interrogation Techniques’: Poetry, Translation, and the News.” ALSCW Annual Conference, Catholic University of America, Washington, DC. 28 October 2016, 8 a.m.
“Alone with Language: On Exophonic Writing.” Outside-in / Inside-out. A Festival of Outside and Subterranean Poetry. Glasgow Women’s Library, 23 Landressy St., Glasgow, Scotland. 7 October 2016, 11:30 a.m. – 1 p.m.
6×6 Release Party. With Alex Cuff, Jeremy Hoevenaar, Krystal Languell, Holly Melgard, Cat Tyc, Alex Verdolini. J+B Design and Cafe, 300 7th Street, Brooklyn, NY, 17 June 2016, 7 p.m.
Kopenhaga and Zero Visibility: Reading & Discussion. With Grzegorz Wróblewski. The Baltic Centre for Writers and Translators, Visby, Sweden, 12 March 2016, 4 p.m.
“Poetry, Translation, and the News.” DC-Area Literary Translators Network, Petworth Citizen & Reading Room, 829 Upshur St NW, Washington, DC, February 2016. “What is a Translator?” Panel: “Teaching Translation to Monolingual Students.” ALTA 2015 Annual Convention, Tucson, October 2015 (VIDEO). Bilingual Readings: Russian and Polish. With Danuta Borchardt, Katherine Young, et al. ALTA 2015 Annual Convention, Tucson, October 2015. “Writers Under the Influence: Aaron Belz & Piotr Gwiazda.” Atomic Books, Baltimore, April 2015. “Dreams of a Common Language: A Talk on Contemporary US Poetry.” Department of Philology, University of Silesia, Sosnowiec, Poland, November 2014. Poetry Reading. With Mark Ford, Adam Zdrodowski, Malgorzata Lebda, Andrzej Niewiadomski, and Trupa NaDziko. XXIII Ars Cameralis Festival, Katowice, Poland, November 2014. Poetry Reading and Discussion. With Grzegorz Wróblewski. University of Massachusetts Amherst, Polish Studies Program, Amherst, April 2014. “A Poet, His Translator, and His Paintings: Readings from Kopenhaga.” Rhode Island School of Design, Department of Literary Arts & Studies and Division of Liberal Arts, Providence, April 2014. Poetry Reading with Grzegorz Wroblewski. Cambridge Public Library, Cambridge, April 2014. 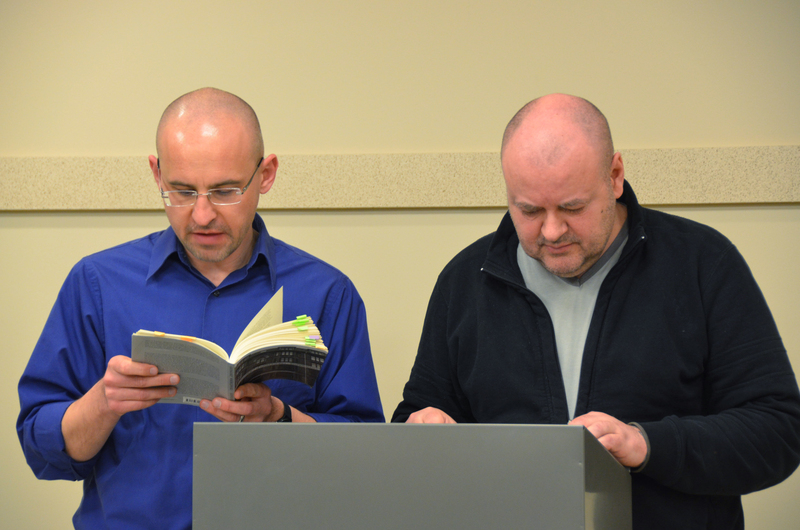 “Poetry and Translation: A Conversation with Grzegorz Wróblewski and Piotr Gwiazda.” Columbia University, East Central European Center and Department of Slavic Languages, New York, April 2014. The Iowa Review, Michigan Quarterly Review, and The Seattle Review AWP Offsite Reading. With Stephen Burt, Arna Bontemps Hemenway, Rebecca Makkai, Dora Malech, Jamaal May, Amber Tamblyn, and Lizzi Wolf. Still Liquor, Seattle, Washington, February 2014. Reading from Kopenhaga. With Grzegorz Wróblewski, introduced by Chris Gutkind and Marcus Slease. Torriano Meeting House, London. February 2014 (VIDEO). Wrogowie/The Enemies Project: Polish Poetry. With Ula Chowaniec, Amy Cutler, Laura Elliott, S.J. Fowler, Francesca Lisette, Joanna Rzadkowska, Angus Sinclair, Marcus Slease, Philip Terry, Grzegorz Wróblewski, Adam Zdrodowski. Rich Mix Arts Centre, London, February 2014 (VIDEO). Grzegorz Wróblewski and Friends: An Evening of Polish Migrating Poetry. With Grzegorz Wróblewski, Adam Zdrodowski, Marcus Slease. University College London, School of Slavonic and East European Studies, London, February 2014 (VIDEO). 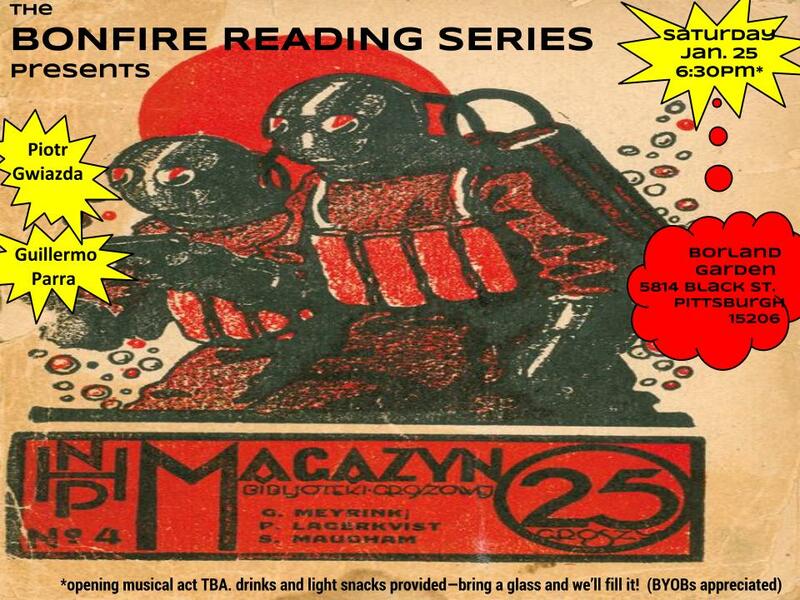 Bonfire Reading Series. With Guillermo Parra. Pittsburgh, January 2014. Poetry & Conversation Series. With Joseph Ross. Enoch Pratt Free Library, Baltimore, August, 2013 (AUDIO). Smartish Pace Poetry Reading. KGB Bar, NYC, December 2012 (VIDEO). “Explaining America: Poetry in the Age of Empire” With response by James F. Knapp. Humanities Center Colloquium, University of Pittsburgh, November 2012. “Why (or why not) Collaborative Translation?” Panel: Problems and Approaches in Translating Contemporary Polish Poetry. 35th Annual American Literary Translators Association Conference, Rochester, October 2012. “Ether: Conformity and Resistance in Contemporary US Poetry.” Poetry and Revolution International Conference, Contemporary Research Centre, Birkbeck College, University of London, May 2012 (AUDIO). “‘A Naked Singularity’: James Merrill and Identity Politics.” Panel: Complicating Post-War Reputations, Poetic Communities and the Individual Talent Conference, The Kelly Writers House, University of Pennsylvania, Philadelphia, April 2012 (VIDEO). Smartish Pace Poetry Reading With Campbell McGrath. The Walters Arts Museum, Baltimore, April 2012 (VIDEO). “Two or Three Ideas: Translating Grzegorz Wroblewski’s Kopenhaga.” Panel: Translation and World Literature. With response by David Damrosch. Modern Language Association Annual Conference, Seattle, January 2012.